Another new race, the 13th, of the downy mildew pathogen (Peronospora farinosa f. sp. spinaciae) of spinach has been found and documented. First identified in January 2010 from spinach in Holtville, California, this race breaks the resistance of several important cultivars. The isolate was initially designated as UA0510C and was characterized with a standard set of differential varieties. Isolates apparently identical to UA0510C have been found in an increasing number of locations throughout California in 2010 and 2011. After careful evaluation of the significance of this development to the spinach industry, the International Working Group on Peronospora (IWGP) has designated this isolate as race Pfs 13. The IWGP is located in The Netherlands and is administered by Plantum NL. Race Pfs 13 poses a threat to the spinach industry because it is particularly well-adapted to modern hybrids with resistance to races 1-12. The appearance of a new race is not unexpected because hybrids with resistance to races 1-12 have been widely planted over the past few years. Similar developments have taken place when races Pfs 5 (1996), Pfs 6 (1998), Pfs 7 (1999), Pfs 8 and 10 (2004), Pfs 11 (2009), and Pfs 12 (2009) were identified and named. The occurrence of Pfs 13 will clearly encourage the industry to develop and use new spinach cultivars having resistance to races 1-13. A history of the detection of the various spinach downy mildew races is presented in Table 1. A collaboration of researchers with the IWGP, University of Arkansas (Correll), and University of California (Koike) is monitoring the development of new races of spinach downy mildew on a global scale by collecting and testing suspected new isolates. In this way it is hoped that research findings and conclusions will be agreed upon and better communicated between the seed industry, spinach growers, and other interested parties. For California and Arizona, the Correll-Koike team will continue to receive and test spinach downy mildew samples for growers, pest control advisors, and seed companies. 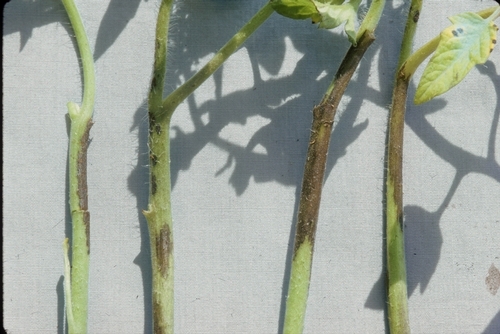 Industry is encouraged to continue to submit downy mildew outbreak samples to Correll-Koike, as such samples facilitate the discovery of additional new races. The Correll-Koike research is made possible by support from the California Leafy Greens Research Board and by active participation by the agricultural industries in California and Arizona. For more information on this subject you can contact Steven Koike (stkoike@ucdavis.edu), Jim Correll (jcorrell@uark.edu), Diederik Smilde (d.smilde@naktuinbouw.nl), or IWGP chairperson Jan de Visser (JandeVisser@popvriendseeds.nl). Downy mildew of spinach is the most important disease on this crop and results in quality and yield losses. 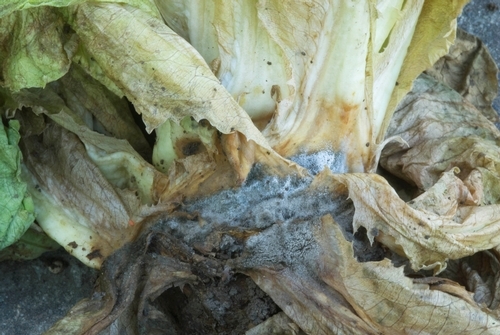 The unusually cold, wet, and rainy weather during March through June 2011 has created conditions that favor the development of Botrytis crown rot of lettuce in several counties in coastal California. 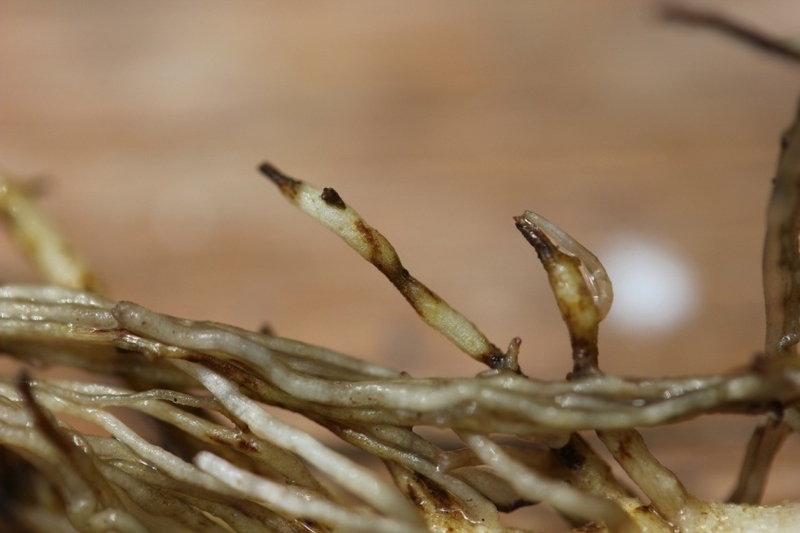 Botrytis crown rot, also known as gray mold, has resulted in stand loss and reduced yields in numerous fields. Transplanted lettuce: Crown tissue on transplants in the field becomes brown to orange-brown in color and soft. 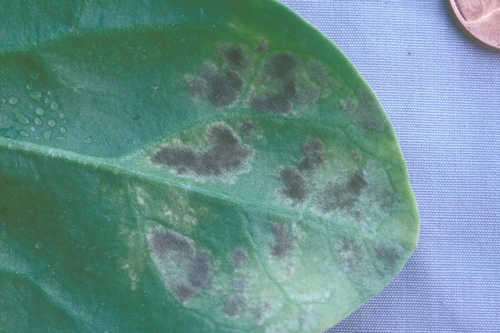 The characteristic fuzzy gray sporulation of the pathogen is usually present on the affected crown tissue in contact with the soil. Botrytis crown rot causes transplanted lettuce to wilt, collapse, and eventually dry up and die. While still in trays and under greenhouse conditions, lettuce transplants can also become infected with gray mold; however, such infections are usually associated with old, overgrown transplants in which the older leaves have begun to age, turn yellow, and decline (senesce). Direct seeded lettuce: Direct seeded lettuce can also succumb to Botrytis crown rot. Under most conditions such fields have lower disease incidence and the problem is less serious. However, in spring 2011 a number of direct seeded fields also experienced significant dieback from this disease. Mature lettuce: Lettuce plants near maturity may appear healthy but develop crown rot close to harvest. Diseased plants will start to wilt, lower leaves turn yellow then brown, and the entire plant will collapse. Examination of the crown will show extensive gray sporulation and the soft, orange-brown decay. Such plants likely were infected earlier in the season and collapsed when the pathogen rotted a significant portion of the lettuce crown. The pathogen. The causal agent of gray mold on lettuce is Botrytis cinerea. This fungus is a very common organism that readily grows as a saprobe on dead, declining plant tissue and organic matter. 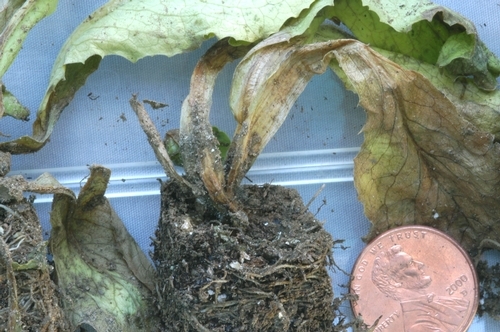 The characteristic fuzzy, velvety, grayish brown growth of the fungus can often be readily seen on diseased areas of the lettuce, especially on lettuce crowns in contact with soil and that may be shielded from the sun by overlying leaves. 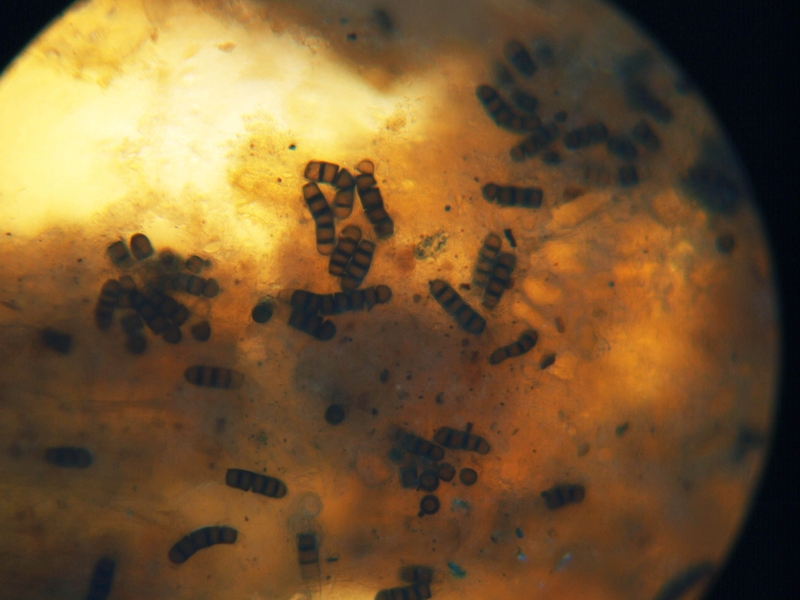 Black sclerotia (hard fungal resting structures measuring from 1/8 to 1/4 inch in diameter) may form on these diseased tissues, although some isolates produce few or no sclerotia. Sclerotia are usually dome-shaped or rounded and may appear similar to sclerotia produced by the species of Sclerotinia (S. sclerotiorum) that produces large sized resting structures. 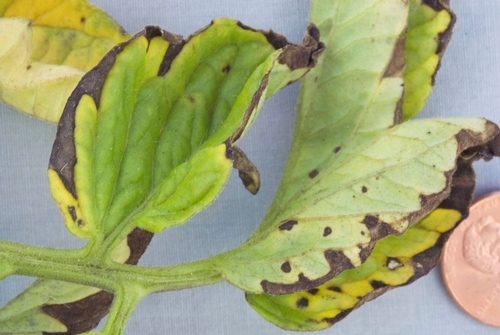 Botrytis cinerea of lettuce is the same pathogen that causes gray mold disease on grape, strawberry, tomato, ornamental plants, and many other crops. Disease factors: Botrytis crown rot affects all types of lettuce: iceberg, butterhead, green leaf, red leaf, romaine. Botrytis cinerea most readily infects lettuce tissues that are damaged and exposed to moist, wet conditions. For this reason, Botrytis crown rot is most commonly seen on transplanted lettuce. The process of transplanting lettuce results in unavoidable, minor cracks and injuries to the transplant. If B. cinerea inoculum is lacking, such injuries are incidental and cause little concern. However, if the fungus is present then such wounds allow the pathogen to readily invade and colonize the plant crown. 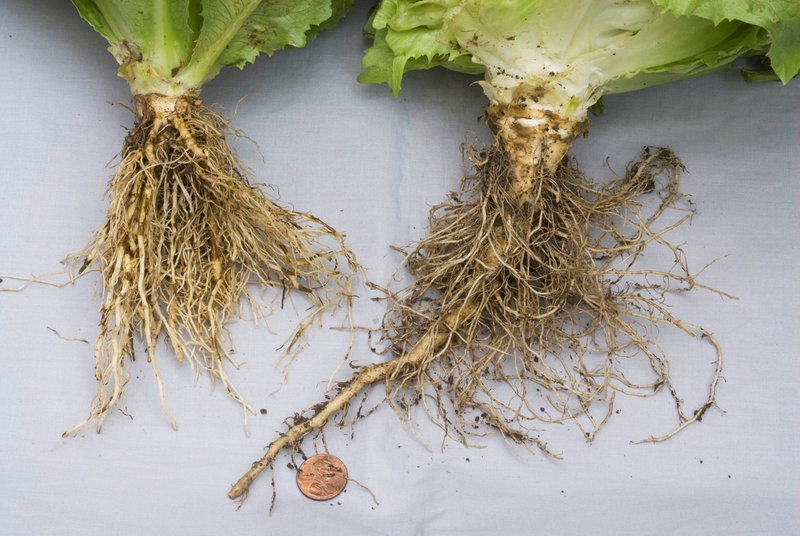 Because spring and early summer romaine is often transplanted, most Botrytis crown rot cases in 2011 involved romaine. Diagnosis: Diagnosing gray mold will require careful examination. 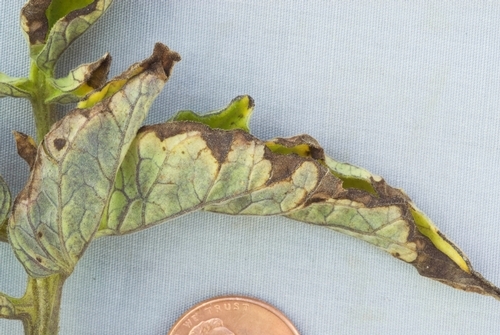 Overall plant wilting and collapsing symptoms caused by gray mold may look very similar to such symptoms caused by Sclerotinia minor (lettuce drop) and perhaps Phoma exigua (Phoma basal rot). Accurate diagnosis, therefore, requires careful examination of the crown and perhaps lab confirmation. 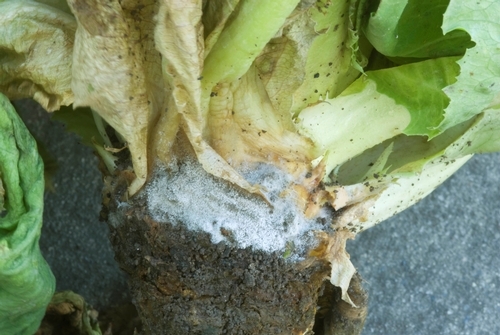 Note that if rotted lettuce crowns are colonized by white fungal mycelium, the pathogen is likely Sclerotinia. Control. 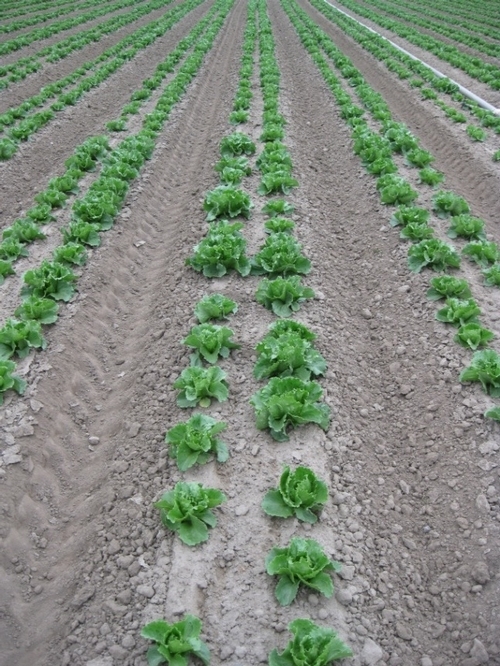 Because B. cinerea initiates infection on damaged tissues, as much as possible minimize damage to lettuce that is caused by cultural practices, environmental extremes, or other pathogens and pests. 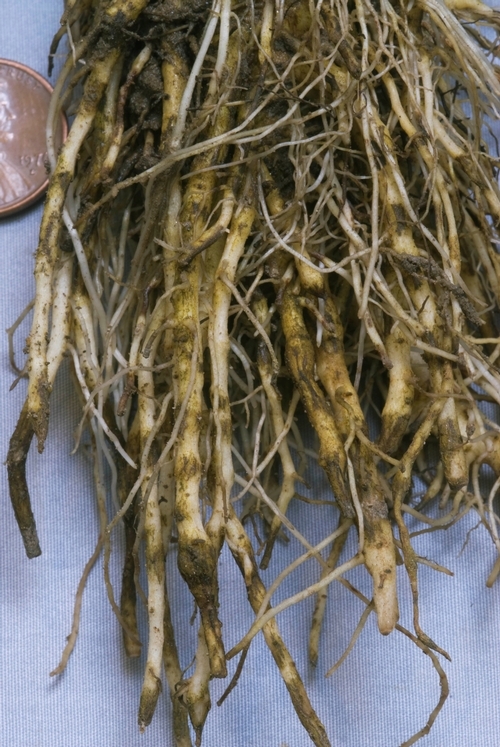 Use transplants that are not too large and overly mature; older transplants are subject to additional leaf breakage and damage during planting, and hence are more susceptible to gray mold infection. 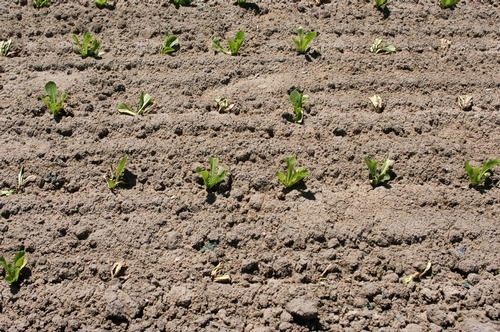 Limit damage to lettuce transplants during the planting process, though it is not possible to prevent all injury. In the field, reduce leaf wetness by avoiding or reducing sprinkler irrigation. Schedule crop residue incorporation and soil preparation so that excessive plant residues are minimal at planting. It may be helpful to apply fungicides to protect plants from gray mold. However, if weather conditions strongly favor Botrytis crown rot, such applications may be limited in effectiveness. Before using any fungicide for the control of B. cinerea on lettuce, check product labels and your local Agricultural Commissioner's Office for use information and restrictions. Figure 2. Orange-brown soft rot and gray sporulation on lettuce caused by Botrytis cinerea. Figure 3. Reduced romaine stand due to Botrytis crown rot of transplants. Figure 4. Lettuce transplant infected by Botrytis cinerea. The cucumber crop in central coast California is a minor crop, with only a modest acreage planted annually. However, a major disease threatens this commodity that is grown both out in the field and inside greenhouses. 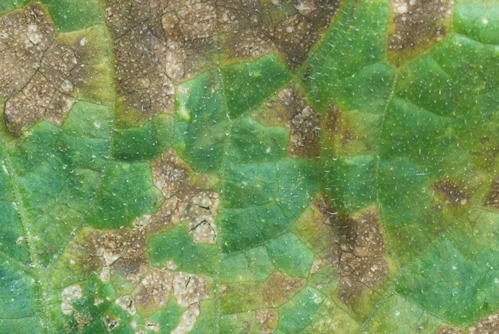 In recent years, a very aggressive, destructive strain of downy mildew (the pathogen is Pseudoperonospora cubensis) has devastated cucumber plantings. Leaves first develop angular shaped lesions that turn yellow. Later, the tissue in these lesions dies and becomes brown (photo 1). In most cases the diagnostic purple gray mycelium and spores develop on the leaf undersides (photo 2). As disease progresses, entire leaves decline and the plants collapse due to severe infection. 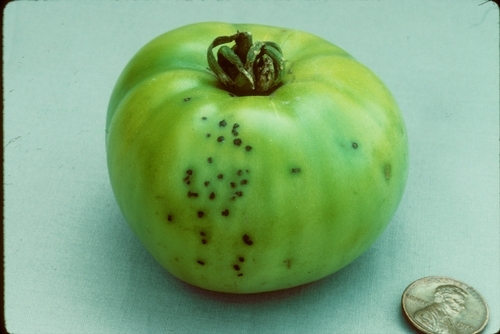 Downy mildew also infects squash and watermelon, though this current problem is most problematic on cucumber. California growers are hardly alone in this situation. Last year the aggressive downy mildew damaged cucumber crops in various parts of the USA, along the eastern seaboard stretching from New York down to Florida, and from there extending west as far as Wisconsin, Illinois, Missouri, Louisiana, and Texas. For California, downy mildew was reported on production cucumber in the central coast and other regions, and on seed cucumber crops in the upper San Joaquin Valley. Management of this apparently new cucumber strain is difficult. Organic producers have few options because protectant sprays do not appear to help, and suitable resistant cultivars have not yet been identified. For conventional growers, early preventative sprays should be made (see the UC IPM website: http://www.ipm.ucdavis.edu/PMG/r116101611.html). This cucumber situation is yet another case illustrating how this group of pathogens is able to change and cause problems for growers. Central coast growers are already very familiar with the new races and aggressive outbreaks of lettuce and spinach downy mildews. Plant Pathologist Steven Koike is monitoring the California cucumber situation and is collaborating with researchers in Michigan and North Carolina. He is interested in hearing about downy mildew outbreaks on cucumber in California (phone 831-759-7350; stkoike@ucdavis.edu). 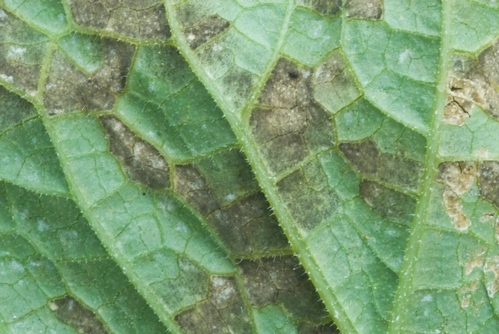 Photo 1: Angular lesions on cucumber caused by downy mildew. Photo 2: Downy mildew lesions support the purple growth of the pathogen.